1. You accept the inevitability that is a Saturday afternoon traipsing around Marks & Spencer, Homebase and Primark with bags hanging from every limb like baubles on Christmas tree. The promise of a duvet day a distant memory as you find yourself biting your lip watching aghast whilst wee Chantelle screams at her mammy that the Peppa Pig she wants has a nose ring and not the diamante encrusted tail version the bedraggled woman has picked out instead. 2. You put on your big boy (or girl) pants, stick an extra layer on and find a game that has survived the harshest that winter could throw at it from Links Park or Cappielow. It may not be an instant classic, in fact it might turn out to be downright terrible but at least you’re out the house doing the thing that the footballing gods decreed you do on a Saturday afternoon. There really is only one option and with that option there is usually the promise of a nice hot pie, so with that in mind, let’s rate one of these pastry beauties, let’s some pie! Price: At £1.40 this is 30p more expensive than the scotch variety from the same venue but in the luxury market a relative bargain costing much less than some of its senior scotch contemporaries. Presentation: A single fold of jaggy blue paper towel left me aching for the classic simplicity of the softly layered medium-sized white napkin. 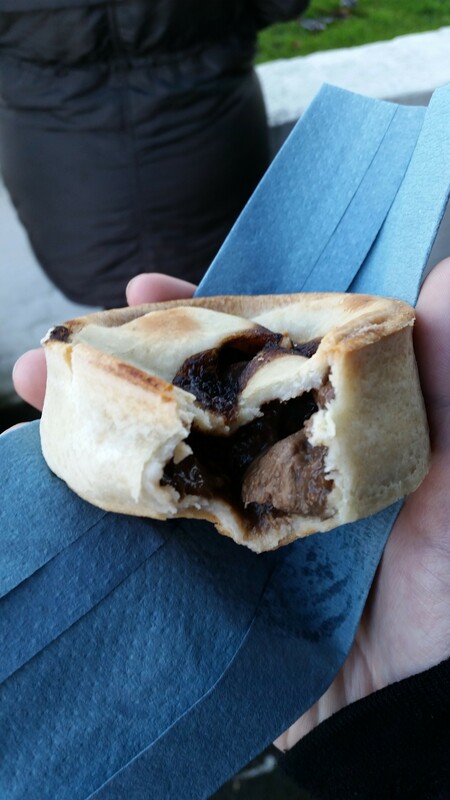 There was however no tin foil case surrounding this steak offering, a rarity when it comes to pies of this nature, meaning it could be held comfortably in the hand without having to juggle your snack as a way of shielding yourself from the scolding heat these cases often provide. Meatiness: This pie was formed of large chunks of steak, perhaps a little too large as it wasn’t as tender as it could have been feeling a little chewy in the mouth. The gravy was thick but perhaps a tad salty for some, personally though I think it managed to stay just the right side of well seasoned. Although well seasoned it wasn’t amazing to eat. The main problem being its temperature with it being just a little cold, no doubt a subsequence of the demand far outmatching the supply with pies coming out of the oven almost as soon as they went in. A bit more heat and everything could have been that little bit more unctuous. Pastry: As previously stated this pie was a little cold and as such the pastry was a little soft and pale although there was still a touch of crispness to the very top edges. In actuality the fact this pie was a little cool helped keep it together as a crisper pastry and thinner gravy could have resulted in a right old mess without the safety of a tin foil case to hold it all. Overall: A nice pie taste wise but the cooking of the meat somewhat let it down, it also could have been hotter but I’m not going to hold that against it too much. At the end of the day though it was just nice. Gravy Factor: Bog Standard Steak Gravy. 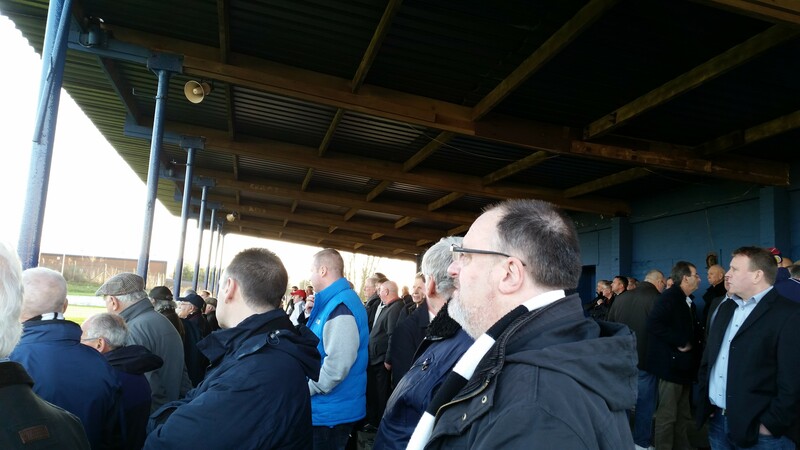 Pie 82 has now been reviewed for you, I actually had to do this twice as my first draft got lost to the gremlins lurking within my laptop that won’t deter me from soldiering on though and next up is an offering from another junior outfit, Thorniewood United, but until next time go forth and eat pie! 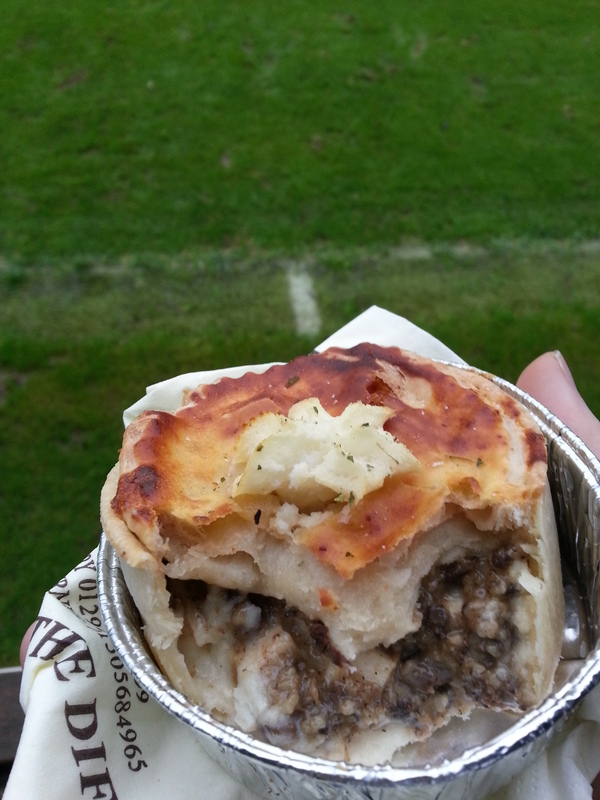 This entry was posted in Football Pies, Junior Pies, Luxury Pies, Sporting Pies, The Life of Pie and tagged dundee violet, fitbaw, Football, Gravy, Juniors, luxury, Meat, meatfilledpastries, pastry, Pie, pollok, scottish junior cup, steak, thorniewood.